Asry has emphasised that positive aspects in its facilities and services are helping it gain repeat customers manifesting their loyalty. 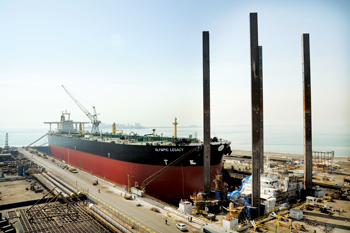 Carrying on from the strong start received at the beginning of the year, Asry has moved ahead with its order book looking increasingly healthy, the yard’s chief executive Nils Berge indicated. “Ship repair is seeing a healthy mix of scopes coming in. Small, medium and large jobs are being won in equal measure to utilise our wide range of facilities simultaneously. The slipways have continued to see excellent business, at one point recently having six ships under repair at the same time,” he said. The chief executive said the offshore market predictably was going through a strong period for Asry with several major clients entering scheduled repair time windows throughout this year. “The number of rigs in the yard throughout the first quarter provides a reassuring variety to the revenue streams. A greater emphasis on growing the number of Asry’s onsite specialist contractors is ramping up this year. Last month welcomed a new dedicated living quarters outfitter and HVAC facility operated by UAE-based Seven Seas within the yard. The facility, including a metal fabrication workshop, a carpentry workshop, offices and stores, will increase the variety and quality of accommodation and air conditioning works Asry can offer ship and rig clients. 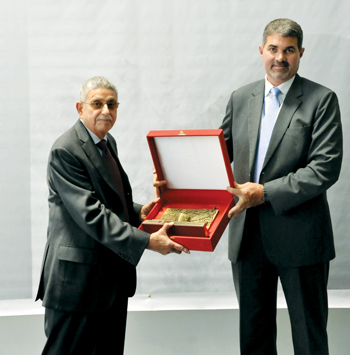 The facility was launched at a ribbon-cutting ceremony in the presence of officials that included Berge, Magdy Mustafa, Asry technical resources and business development general manager, and Seven Seas chairman and owner Freddy Sidhwa. Earlier, Asry had signed agreements with the Solas Marine Services Group and ABB. Solas will build a 2,000 sq m service centre for life boats, life rafts and fire-fighting and life-saving appliances in Asry, which will not only expand Asry’s services portfolio, but also bring new business opportunities to Bahrain itself. The agreement with ABB sees the French firm opening a new workshop in Asry to provide international factory warranties from the ship yard and onsite accessibility for the yard’s customers to ABB’s worldwide service network. The company is working hard to surpass its performance of last year. 2013 was the fourth year of consecutive growth, with $199 million in revenues, an increase of 12.1 per cent on 2012’s total, and a record equalling 184 vessels repaired. Considering the aggressive market conditions that continue to pervade global shipping, these results are considered a very encouraging endorsement of Asry’s maintenance of its regional prominence. The offshore division did well in 2013 and some projects shifted into 2014. 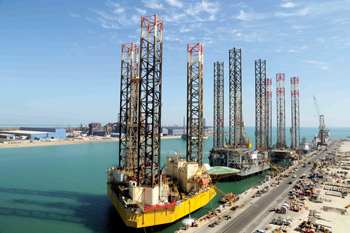 A total of 17 rigs had completed repair work contributing 42 per cent to total revenues. In the past three years Asry has gone from stacking 12 jack-ups to now only having two. Each unstacked rig is now in service, with several of them being converted or maintained by Asry itself. The second trend for the company was an expansion into regions beyond the Middle East, a particular highlight being a breakthrough in the Indian market with two major repair jobs coming from the Subcontinent – Victory Driller and Deepsea Treasure. The third trend was the reinforcement of relationships with long-term clients. “Asry is synonymous with long-term relationships and has built its 36-year history on repeat business, and this approach is now being fully adopted by the Offshore division with many of their customers in 2013 being customers since its inauguration such as Ensco, Rowan, Saudi Aramco and more,” the company stated.